We're getting to the point where 3D is about as likely as Dippin' Dots to be the future. And for all of its clumsy, forced iterations, there's maybe nowhere that third dimension has been less successful than in phones. This recently discovered Apple patent indicates that Cupertino's either going to cure all our 3D headaches with a better system, or taint one of our favorite gadgets with its crushing pointlessness. In one embodiment, the first imaging device may be a Light Detection and Ranging (LIDAR) sensor. The LIDAR sensor may emit laser pulses that are reflected off of the surfaces of objects in the image and detect the reflected signal. The LIDAR sensor may then calculate the distance of an object from the sensor by measuring the time delay between transmission of a laser pulse and the detection of the reflected signal. Other embodiments may utilize other types of depth-detection techniques, such as infrared reflection, RADAR, laser detection and ranging, and the like. 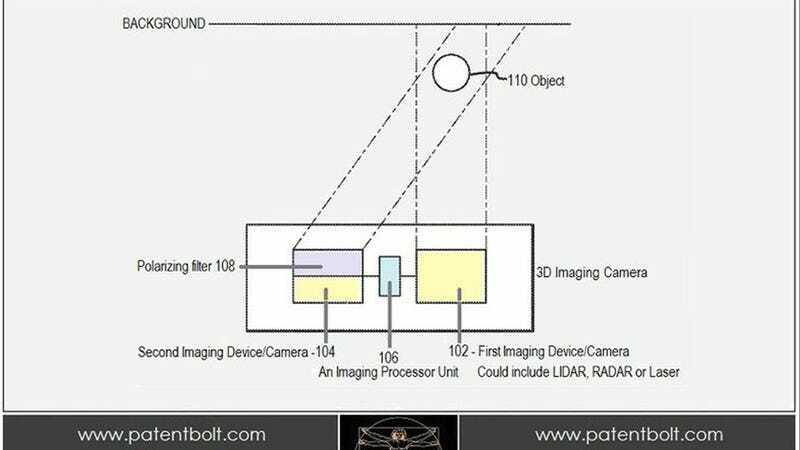 It's a comprehensive patent that runs through several means to the 3D end, and more than a few applications (such as facial recognition).